The Internet is filled with security and privacy threats. Therefore, you need to stay alert. You cannot simply ignore the things the things that you can possibly do in order to protect yourself from data thieves and hackers. There are also those instances wherein you’re left without a choice but to connect to a public or shared wireless network. In such cases, you could definitely use a free VPN tool such as Spotflux. Spotflux is a VPN service that comes in free and paid versions and it is available on Windows, Mac OS X, Android, and iOS with an optional Chrome extension for Windows, Mac OS X, and Linux if you opt for that. For the purposes of this review, I tested the free version of Spotflux and the Spotflux Chrome extension, which goes by the name of Spotflux Lite. In terms of features, however, you get pretty much the same thing regardless of if you download Windows, Mac OS X, Android, iOS, or Chrome versions. Spotflux collects no personally identifiable information regarding its users in an effort to maintain their privacy and anonymity in connection with their use of the Spotflux services (the “Services”). We may use real-time analytics to facilitate commercial transactions and to provide you with a more personalized experience however this is rarely done and is done in a manner that does not keep a personally identifiable record in our systems. Currently Spotflux provides USA-only servers/IP addresses — you won’t be able to connect through a Spotflux server that isn’t in the USA because Spotflux only has USA servers. Take note this does not mean that only people in the USA can use Spotflux; everyone around the world can use Spotflux. What this means is your IP address, once connected to Spotflux, will be a USA IP address and your internet traffic will be routed through Spotflux’s server(s) in the USA. Nowadays, you cannot always guarantee that the network that you’re connected to is 100% safe. This is usually the case especially if you are often using hotspots to connect to the Internet. As a result, you become a vulnerable target for spies, data thieves and hackers. So if you don’t want to become a sitting duck, you better equip yourself with the necessary tools that could protect your data while you’re surfing the web. As for the Spotflux Chrome extension, it basically provides you with a “free VPN in a browser”. In other words, this free Chrome extension will automatically encrypt your browsing data (via SSL) as it connects you to the global Spotflux security cloud. Therefore, you’re free to surf the web anonymously and you can even visit those geo-restricted sites such as Hulu, Netflix and DramaFever. You can even use this extension to watch or stream some videos that aren’t allowed in your area. Unlike other VPN providers, Spotflux doesn’t require the installation of any third-party software or application. All you need to do is to install the extension to your web browser and you’re all set to browse the web just like you usually do and just let the extension do the rest of the work. Once installed, the extension will place its icon on your browser’s URL bar (omnibar) so you can easily tell if it’s enabled or disabled. It will also indicate the total number of sites that it has secured. Apart from this, the said extension will also function even if you’re using your Chrome browser’s incognito window. Another thing that I like about this tool is that it automatically hides your IP address. It also uses rotating IP addresses so you don’t have to change or update your IP from time to time. It’s also great to know that this free VPN doesn’t have any speed or bandwidth limits. It also features a built-in anti-malware tool that automatically detects and blocks those phishing sites. 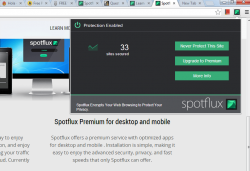 All in all, the Chrome extension of Spotflux proves to be a decent option for users who simply wish to secure their web browsing sessions. However, the protection that it can give is only limited to web browsing. It cannot secure the connection that you have on your email client, IM client and other web-enabled applications. It also offers limited options and you cannot change its proxy server settings just in case you want to use a static IP address for your VPN connection. If you want to use its free VPN service on other platforms such as Windows, Mac, iOS and Android, then you’ll need to download a different software or application. You can also opt to upgrade to Spotflux Premium in order to make the most out of its features and options. 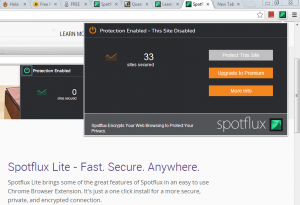 Spotflux provides a hassle-free way for you to encrypt and secure your web browsing sessions. With its help, you can automatically hide your real IP address and surf the web anonymously — and browse those sites that you cannot normally access due to geo-restrictions. It may have some downsides but this is definitely one of the best free VPNs you will find out there… as long as you don’t mind USA-only servers/IP address. Overall, if you are looking for a VPN, this is definitely it; you can use the free version and opt for the paid upgrades if you like it enough. Or don’t get the paid version — the free version is awesome as it is.